We’d love your help. Let us know what’s wrong with this preview of The Best American Magazine Writing 2014 by Sid Holt. Our annual anthology of finalists and winners of the National Magazine Awards 2014 includes Max Chafkin's oral history of Apple from "Fast Company," Joshua Davis's intimate portrait of tech pioneer John McAfee's personal and public breakdown from "Wired"; Kyle Dickman's haunting investigation into the preventable death of nineteen firemen battling an Arizona wildfire; and Our annual anthology of finalists and winners of the National Magazine Awards 2014 includes Max Chafkin's oral history of Apple from "Fast Company," Joshua Davis's intimate portrait of tech pioneer John McAfee's personal and public breakdown from "Wired"; Kyle Dickman's haunting investigation into the preventable death of nineteen firemen battling an Arizona wildfire; and Ariel Levy's emotional account of extreme travel to a remote land--while pregnant--from "The New Yorker." 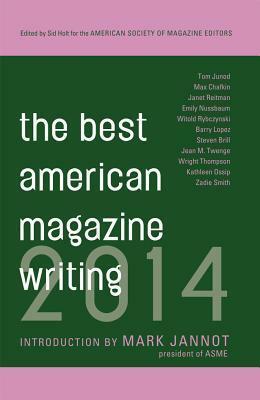 To ask other readers questions about The Best American Magazine Writing 2014, please sign up. I'm not quite sure how I happened upon this book, but I am glad that I did. I never knew that awards were given out for magazine articles. In hindsight, I suppose I should have known that such awards existed, but oh well. Next to books, magazines are among my favorite things to read. The hectic schedule at my soul- sucking job leaves little time for me to read the magazines I currently subscribe to, let alone articles from publications I don't subscribe to. "The Best American Magazine Writing 2014" provided me with the opportunity to read articles from a wide spectrum of publications and writing emphasis. It was a pleasure to read such well- written, researched articles penned by a variety of talented and accomplished writers. Hands down, my favorite article in the book was "Jahar's World" written by Janet Reitma for Rolling Stone magazine (finalist in the reporting category). Rolling Stone's apotheosized cover picture of Boston bomber Dzhokhar Tsarnaev kept a lot of people from picking up the issue this article appeared in (myself included). Although I do not regret my decision to boycott that specific issue, I regret that it kept me from reading such a captivating article. I abhor what Dzhokar (known to friends as Jahar) and his brother did, but after reading this article, I feel like I understand what may have motivated Dzhokar to carry out what he did with his brother. Only a well- crafted article could make me feel as conflicted as I did after reading this article. Profiles of the Boston Marathon bombers, a retired Michael Jordan, eccentric tech tycoon John McAfee who's accused of murder in Belize, and a severely disabled man who runs marathons. A brilliant expose of America's for-profit healthcare industry. Tragic accounts of migrants trying to make it to Australia, the survivors of Sandy Hook, a travel writer's miscarriage during a trip to Mongolia, the sinking of the replica ship Bounty during Hurricane Sandy and the shocking sudden deaths of an entire crew of 19 firefighters in Arizona. suspect, Dzhokhar Tsarnaev. A good variety of subjects explored here. A lot of these stories exist to confirm with some pretense of authority what many readers would like to hear (that Michael Jordan is very competitive but also a little sad, that a woman can birth babies after 35, etc etc.) Though i take great pleasure in reading stuff like this "at the dentist's office". This anthology of award-winning journalism has some real gems that I might not have otherwise read. The Rolling Stone article on the Tsarnev brothers was so well-reported and also chilling. I loved the Esquire profile on Matt Damon, and there's a simply amazing article from Runner's World called "Bret, Unbroken" that is a must-read. Ugh! Finally done. Read this cover to cover, every story. Some rather interesting ones, and some rather boring ones. Took me far too long, with many long breaks between readings. Read excerpts, not the whole thing. I read *The Best American Magazine Writing 2014* over the summer for AP Language and Composition. Although I was not looking forward to it, I loved the book. I was able to challenge myself and read articles that I never would have considered before. I'm excited to read the 2015 edition. I counted. I have 15 years' worth of this series. This is the first cover to cover read since 2002. Good stuff. Read it! The first two articles were a little bland but after that; not a dull one in the bunch.